FotoEditor is a free Windows 8 photo editing app that allows you to edit and enhance photos using several available filters. This photo editing app comes with very clean interface suitable even for the beginners. The app for Windows 8 allows you to either directly take photos using your web cam and edit them or you can upload and edit any photo stored in your computer using their respective options which are Camera and Photos. FotoEditor Windows 8 app comes with about 40 professional level filters and effects which are categorized as adjustments, artistic, distort, morphology, stylize, crop and operations. Adjustments category includes slider control filters for adjusting brightness, gamma, contrast, Tint Blue, Tint Red, Tint Green and RGB. Artistic category includes few artistic filters for adding artistic effects like classic, grey scale, oil paint, posterize, color pencil and sepia. Distort category includes filters like cylinder, tile, pinch, punch and Twirl. Morphology category comes with filters like Dilate, Jitter, Sharp, saturation, normalize, soften, equalize and erode. Stylize category includes filters like night vision, solarize, negative, emboss and tritone. Crop category includes few preset crop ratios for cropping a photo. In addition, you can even crop photos freely. Operations category includes options like Mirror H, Mirror V, Rotate 180 degrees and rotate left. The Windows 8 photo editing app comes with an Undo option to undo changes with a single click. FotoEditor allows you to save the processed image in JPEG or PNG format. FotoEditor is available in the app store within the Photo category under Top free as well as All Stars sub category. 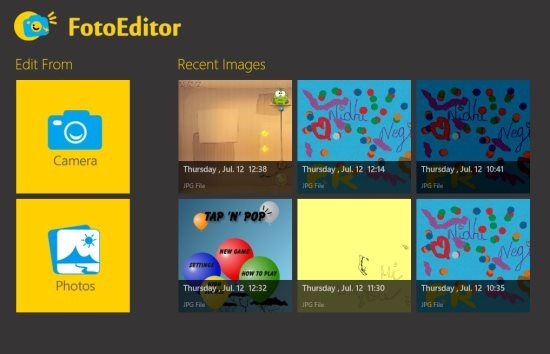 Don’t forget to check out Photo Monkey app for Windows 8 reviewed by us. Comes with about 40 filters and special effects. Option to take pictures using webcam and edit them. Save the processed image in JPEG or PNG format. Pre-set crop ratios for cropping photos or simply crop photos freely. Undo option to undo the changes made. Basic and clean interface makes it easy to use. 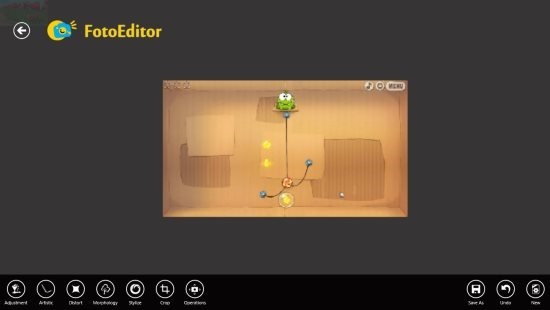 In short, FotoEditor is a full featured photo editing app for Windows 8 using which you can edit photos and enhance photos like professionals. Try FotoEditor for free available at Windows 8 app store.